The day has ended, darkness has fallen, and low-wattage bulbs have flickered to life up and down Observatory Road in Kodaikanal. The nightly in-gathering has begun. As it does each day, life in this small Indian mountain town has shifted, flowing from field, forest, and workshop to the food stalls that line this congested, pot-holed street. 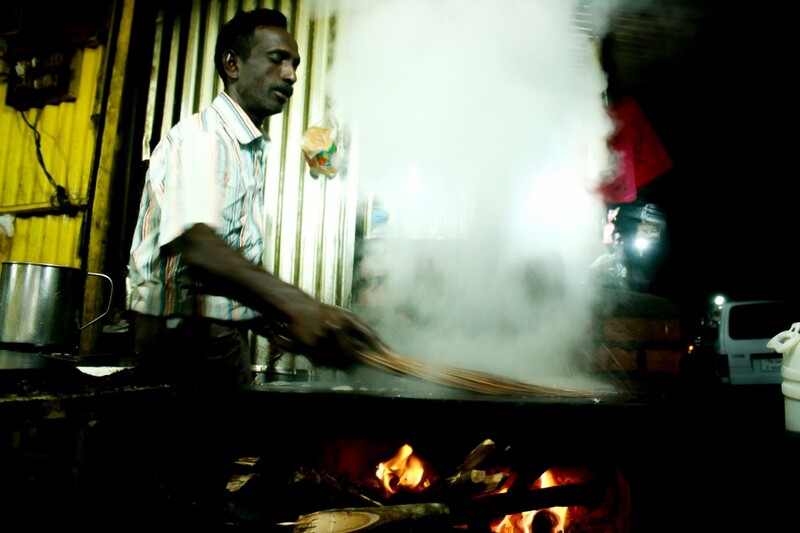 Wood fires have sprung up, heating iron cooktops and steaming vats of curry. Smoke and steam sit heavy in the air and obscure the faces of those who eat and those who wait. Sanjeev works with clock-like efficiency. His skilled hands move over the fire with a confidence and precision culled from thousands of hours spent standing in this exact spot doing this exact thing. He is the bread man. Parota and dosas are poured and spread and flipped and folded and fly off the griddle, piling up on the counter, fifteen rupees a piece. Three men from the tire shop across the street have locked their corrugated metal door and come over for parota and curry. They buy a dozen, sit around a small plastic table, and eat with black-stained hands that will never wash clean. A family of wood-cutters traipse down the mountainside, barefoot children streaming behind. They stand before Sanjeev, tentative, like Oliver Twist, and count their crumpled bills with a hungry look in their eyes. They pay for six dhosa, but Sanjeev gives them eight. There are no movie theaters or shopping malls in Kodaikanal. Instead, community happens around the fires and fluorescent lights of Observatory Road. A piece of bread, a bowl of curry, and a cup of sweet milky tea are more than enough to fuel two hours of gossip and conversation. This is the heart of the town, and it beats every night.